SUMMARY: In this week’s chart, we learn about marketers’ perception of customer mobile behavior, and how these devices have affected the path to conversion. Q: How have mobile devices changed your organization's customers' behavior? As you can see, almost half (47%) of surveyed marketers indicated they believed customers were moving away from traditional online channels to mobile, while 43% felt mobile channels were increasing interaction with their brands. 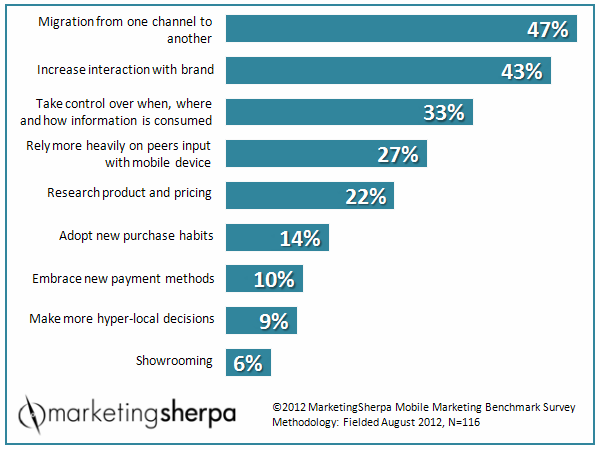 Is mobile payment part of your marketing efforts? Interestingly, one of the more prominent features of mobile commerce -- new payment methods -- ranked relatively low (10%) among our respondents. It appears that customers either haven’t yet tried, or have not fully embraced, mobile payment methods. Has your company incorporated mobile payment into your marketing efforts? Have your customers taken advantage of this, or have they adhered to traditional payment methods? If you haven’t yet adopted mobile payment methods, what factors have prevented you from doing so? What is "showrooming," and how has it affected marketers? It is notable that just 6% of surveyed marketers felt showrooming -- when a customer researches a product in-store, only to find better pricing online -- was an effect of mobile adoption. This may come as surprising to some, given the immediacy and ease of use of mobile payment options. One might expect showrooming to be a more significant response for surveyed marketers -- both from brick-and-mortar retailers concerned about losing sales, and from online retailers looking to reap the rewards. With an abundance of new mobile price comparison apps, such as RedLaser, have you experienced the effects of customer showrooming? Is it something for which you’re accommodating as you move forward? Has this immediate access to customer reviews and price comparisons changed your overall marketing plan? 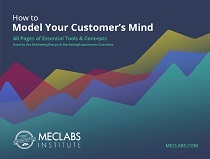 For more information about mobile marketing, download the free excerpt from the 2012 Mobile Marketing Benchmark Report. And, be sure to share your own analysis of this chart in the MarketingSherpa LinkedIn Group for a chance to be published in a future blog post.